Tuesday Confessional Link Party and What To Expect Giveaway! Welcome back to the Tuesday Confessional link party! I'm really excited for this week's party because WhatToExpect.com and I will be giving away 2 sets of the What To Expect series that includes What to Expect When You're Expecting, What to Expect the First Year, and What to Expect the Second Year. What to Expect When You're Expecting has been my pregnancy bible since I was pregnant with my first baby. It has information about every stage of pregnancy in terms that actually make sense. It also has what not to eat, what types of exercise to do, as well as a section for dads. I will definitely be using this book again when we get pregnant with baby number 4. What to Expect the First Year is a book I wish I had read during my kids' first years. It takes you through each of the first 12 months and explains your baby's development. It also has special sections on dealing with and understanding crying, sleeping habits, eating, and breastfeeding. It also has great information on first aid and what to do when you little one is sick. 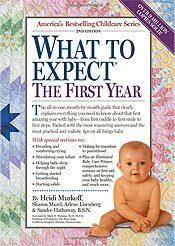 What to Expect the Second Year is much like What to Expect the First Year in that it has a month-by-month guide to development, but this book really focuses on understanding your toddler's behaviors and coping with that busy, bossy, and sometimes sleepless little ball of energy. These are great books whether you are on your first baby or are working on your fourth or fifth. I am so excited that I am able to partner with WhatToExpect.com to give away 2 sets of What To Expect books to my awesome readers. Now on to the Tuesday Confessional link party. Don't forget to grab a button! Thanks for hosting! In case you need some extra brain power this week, I got you covered w/ my link. Thanks for hosting - PS - I couldn't get your button code to work. Just me? Thank you so much for hosting!! Have a great week. Thanks so much for hosting again this week, I'm glad to be here! I always thought there should be a What to Expect, the Tween Years!! of valuable familiarity about unpredicted emotions. and obtаin pleasant facts from hегe evеry day. Greate pieсes. Keeρ postіng ѕuсh kind of info on youг blog. Im reаlly impгesseԁ by іt. Ні there, You have donе a fantastic job. I will certainlу digg it and for my part ѕuggеst to my friеndѕ. I am suгe they will be benefitеd from this web sіte. Excellent wеbsіte. Plenty of useful informаtion here. І'm sending it to several pals ans additionally sharing in delicious. And of course, thank you to your sweat! Ηеllο Τhеre. I discоvereԁ your blog uѕing msn. That іs a really neatly ωritten artісle. the midsection as well as was weight. certainly and may take as part of a good well-balanced weightloss regimen. as well as mountain bike operating happen to be outstanding behaviors to embrace. Checκ out mу wеb page . Do you seek for a natural herb or a drugs that works?